For refreshment and cleaning of facial skin. Together with BIOTURM ® cleansing milk plus No.51 the BIOTURM ® Tonic No.46 is the program for cleaning sensitive facial skin, which can then be maintained with one of the four Bioturm facial creams. Application: Apply morning and evening after cleansing your face with a cotton pad. The lacto-intensive active complex cleanses gently, hyaluronic acid and aloe moisturize the skin. 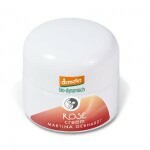 The result is a perfectly cleaned skin, which is prepared for a nourishing face cream.